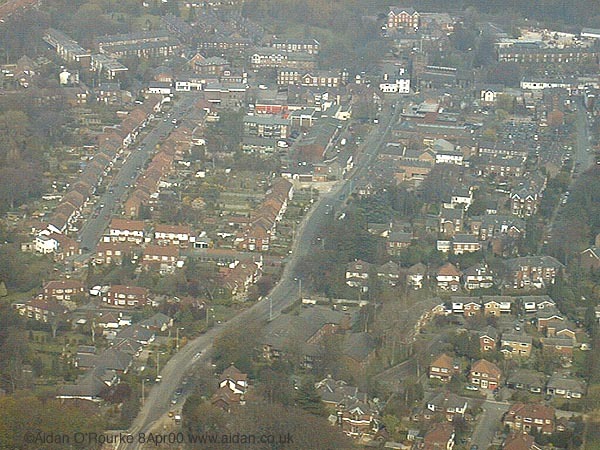 THE FINAL APPROACH TO MANCHESTER AIRPORT runs south west over the eastern part of Greater Manchester, descending over the Pennines, Oldham, Tameside and Stockport, passing over Heald Green before touchdown at Ringway. When there's a north easterly wind, approach is from the south west, over north east Cheshire. Scores of aircraft make the descent every day, and when the weather's clear, there are fantastic views over the conurbation and the countryside all around. Here are some porthole views that will be familiar to many airline passengers arriving at, or departing from Manchester Airport. Can you recognise the locations? Click at the bottom of the page to find the answers. Below us is Ashton-Under-Lyne town centre, crossed by two railway lines and many roads. Here we see one of the three roundabouts you drive through when going from one side of the town to the other. There's a church next to the roundabout centre left- and in the middle of the roundabout is a telephone exchange. 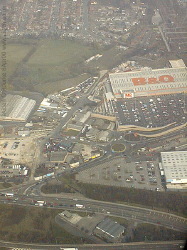 Below us to the right is Tameside College - you can see the cars parked in the car park. An interesting arrangement of streets extends below us, almost in a grid pattern in the bottom. What's that green area with the arrangement of lines and circles? 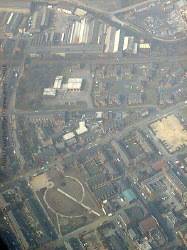 And up at the top of the picture are factory buildings, with a scrap yard in the top right. Is that a fire station in the upper left centre? There are many residential streets in this locality. I can't identify this location- can you? Greenery is all around, and in the top left hand corner of the picture is the River Tame track - all that remains of the railway line which once ran from Reddish North, through Tiviot Dale Stockport and on to Warrington. Just out of the picture to the top left is the River Tame. 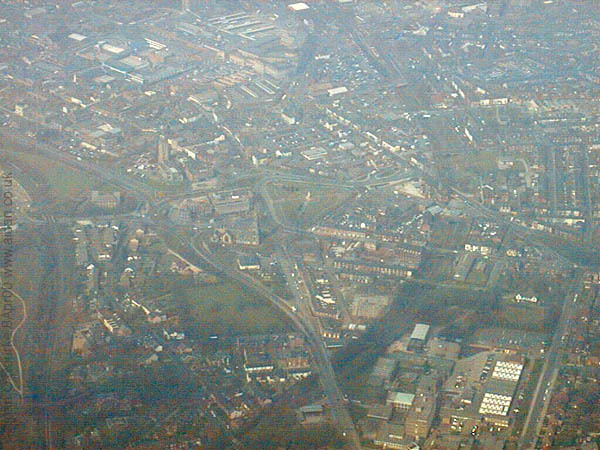 We are over the town centre of Stockport, just west of the railway viaduct. There's no mistaking the recently-opened megastore of the well-known DIY chain B&Q, taking advantage of an excellent marketing opportunity. 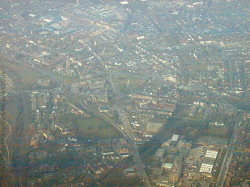 The red brick houses of Heaton Norris lie to the upper left, and on the top right is the main Manchester to London railway line - the overhead electric gantries are clearly visible. 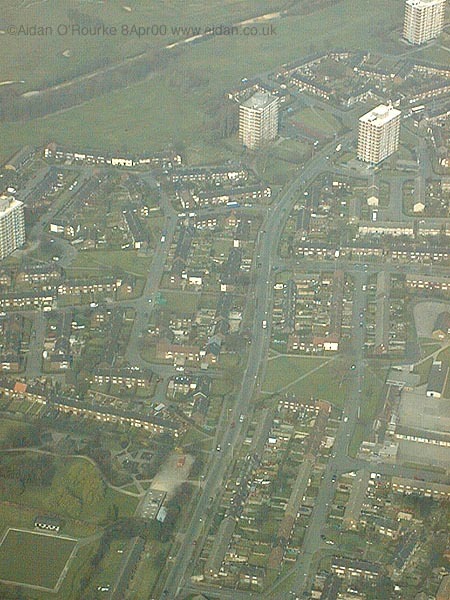 Skirting the very bottom of the picture is the M60 motorway. And there's a new road running alongside it - Travis Brow. There's no trace now of the railway line that once ran from Tiviot Dale station, Stockport to Warrington. There are more commercial buildings, all recently constructed, to the right and left. 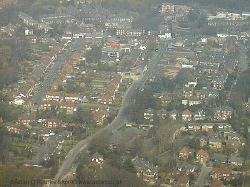 Rows of neat, red-roofed houses line leafy roads, extending from either side of a gently winding main road which runs from the lower left to upper centre. There are also flats and in the upper right, a row of terraced houses, close to the centre of the village. This village, now residential area is Cheadle, in the Metropolitan Borough of Stockport. The main clue as to the identity of this place is the unique combination, at the junction of the road in the upper right, of the White Hart pub and immediately next to it Cheadle Parish church. 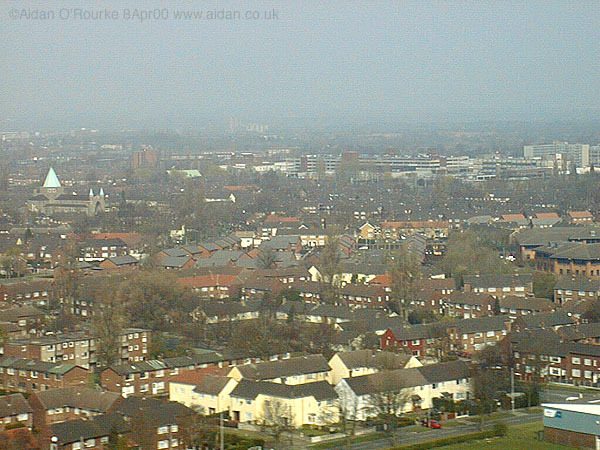 We are close to landing at Manchester Airport, flying at an altitude of less than a couple of hundred feet - in front of us, extending as far as the eye can see on flat land is the City of Manchester's overspill residential district of Wythenshawe the largest council estate in Europe. There's a church with a distinctive conical spire on the left. Is it St Antony's Church?, and over to the right, a multi-storey car park indicates the Forum shopping centre, focal point of Wythenshawe. Just visible in the lower right hand corner is an industrial building, part of the Moss Nook industrial area. 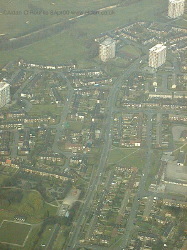 Shadow Moss Road is in the lower right - it gave its name to a 1957 air accident, one of only three major incidents to have taken place in or near Manchester Airport since World War 2. SOON I'LL BE ADDING MORE aerial views of the Manchester conurbation taken on my next flight into or out of Manchester Airport. Click to go to NEXT WEEK's Eyewitness in Manchester update.. Click here to return to the Eyewitness in Manchester home page.